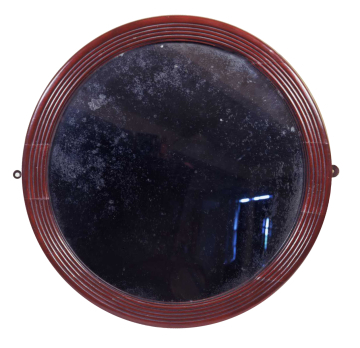 Colour image of XF322, convex mirror, English, unknown maker, early nineteenth century, possibly pear wood, stained brown. ©Sir John Soane's Museum, London. Photograph: Hugh Kelly. Iin a flat reeded frame. This mirror was restored by John Graves in 1991 after being badly damaged by damp. In 2015 this mirror was reinstated in its original position in the recreated Bathroom as part of Phase 2 of Opening up the Soane.